Smart keys are sometimes called key fobs, but what this means is that there is no ignition cylinder and the car is started by a push button. There are a few ways you can replace lost or stolen car keys, but what is the best way to specifically buy new smart keys for cars? Smart keys have some more pressing concerns, but there are also general issues with some of the go-to locations for buying smart keys for cars. This is what you need to know about where to buy these smart locks. Can you buy a new smart key for cars straight from the manufacturer? Most car manufacturers do not allow vehicle owners to directly purchase a smart key for cars. Just go to the website of any car company and look for the smart key for your model. You will not find easily accessible direct purchasing information for a smart key for cars. The most that will be given is that you can find a dealership, but that might not be the best place to buy a new smart key. Automotive companies control who has access to key blanks, and in most cases, it is near impossible to contact the company without using an intermediary. You will likely have to seek out an authorized third-party who has been given permission to sell smart keys for cars directly to the customer. This will inflate the price of car keys, but this can be diminished by purchasing a smart key from the proper location. Can you buy a pre-programmed smart key for cars? Smart keys need to be in the presence of the car they are meant to open in order to be programmed. If a smart key for cars has been programmed, it cannot be reprogrammed. When a smart key for cars comes advertised as pre-programmed, this is either untrue, or it has been programmed to another car and will be useless to you. A smart key for cars can only be programmed once. Even if the key has been invalidated by the car’s onboard computer, it cannot be reused. In this case, the unauthorized key, which is no longer paired with any car, will be useless to anyone. When car owners lose a key and have no spare, most people turn to the modern panacea, the Internet. This might not be the best place to buy a smart key for cars. It is true that the Internet is full of third-party retailers selling smart keys for cars, but the quality of each distributor is going to vary. This variance can be quite extreme, so I would advise anyone looking to buy a smart key online to proceed with caution. The particular dangers of aftermarket electronic car keys are more difficult to detect because smart keys for cars do not always have a readily displayed key blade. In the case of something like a transponder car key, you can get a good idea of whether it has been used by looking to see if the key has been cut. You can also make mistakes with your purchasing and end up with a device that is faulty, or that does not pair with your particular vehicle. It is difficult to distinguish between good and bad online smart key sellers. There are less available methods for assessing the quality of the smart key you are purchasing. You will either have to program the smart key yourself or pay a professional. You are likely to get the lowest price with this option. If you care about the cost of a new smart car key, and most people consider this a chief concern, the dealership will pose a rather large dilemma. That dilemma is that you are likely to encounter the highest price when buying any smart key for cars straight from the dealership. The reason for the historically higher prices has to do with the ease and reliability that most associate with getting work done on your car. You are taking out some of the guesswork of whether you are hiring a person to get you a new smart key can do the work. The dealership will be able to get you a new smart key for any car they could sell you (unless the car is too old, but that is not really an issue for smart car keys), and have access to the literature that will allow them to properly program the key. That being said, you are going to be paying for the privilege of not having to search for alternative vendors of smart keys for cars. The dealership knows that they are the go-to solution for many issues. They also do not rely on smart key replacement jobs, so they will be willing to charge a price without much concern for if you will look for a second quote. In fact, they expect that you will not shop around, so they rarely competitively price these services. 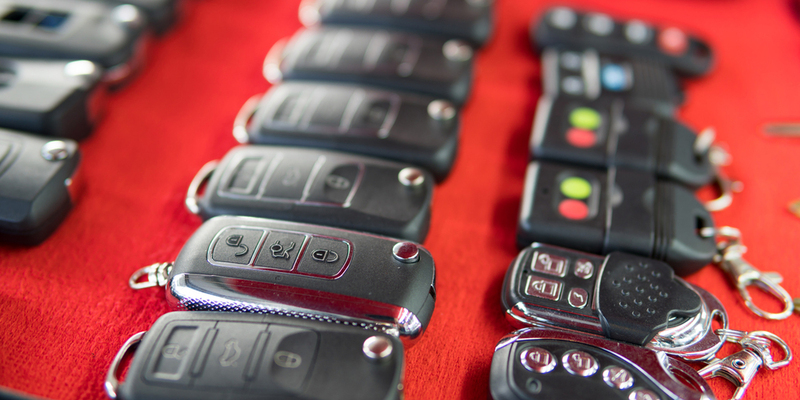 A dealership will be the most expensive option for buying a smart key for cars. Dealerships are easy to find. You can trust that the dealership will get the proper key. The dealership can handle programing. The only thing you have to worry about when you go with a locksmith for buying a smart key for cars is choosing the right locksmith. The trick, if you can call it that, is to make sure you are reaching out to an auto locksmith. Once you have done that, you are that much closer to finding the best place to buy a new smart key for cars. The next thing that you can do is shop around as you would when looking at online retailers. Call up the local locksmiths in your area. Get some quotes on prices. Locksmiths are often hesitant to provide prices over the phone because jobs can become more extensive than the customer is able to accurately represent. This issue is not present in regards to the price of a key. The largest variable is your make and model of your car, but that information can be provided rather easily. One of the biggest reasons that you might find that a locksmith is the best place for you to buy any smart key for cars is they can do more. They can open your car if losing your keys has resulted in a car lockout. A locksmith can program smart keys. If there are more problems and services, they can handle them. But the most important thing is that a mobile locksmith can come to you. If you are not able to drive your car because of an issue with your smart key, this is invaluable. You will need to find an auto locksmith. The locksmith can come to your location. The price will be competitive. A locksmith can solve any other lock or key issue that you have while getting you a new smart key. It might seem bias to say the best place to buy smart keys for cars is from a locksmith, but I would not say that this is the argument I have outlined. The real point is that there are different pluses and pitfalls for every place you can buy a smart key for cars. Key fob replacement has many options, the best one will depend on your needs.